Do you have a young child with sensory needs who struggles to calm down? Then a weighted stuffed lap animal could really help. Recent research from Harvard found the deep touch pressure of weighted items, such as weighted lap pads and vests, has a calming, grounding effect on many children with sensory processing and attention deficit disorders. This may help them self sooth, regulate their emotions more effectively, as well as focus better. You can read more about how weighted lap pads work here. And whilst many kids take to a ‘standard’ weighted lap pad immediately – investing in a soft and cute weighted lap animal (sometimes called a lap buddy) can make the transition to using a lap pad much easier for some children, especially young ones. It’s also, of course, a lot more fun! Let’s take a look at a popular weighted stuffed animal, rated by many parents and therapists. 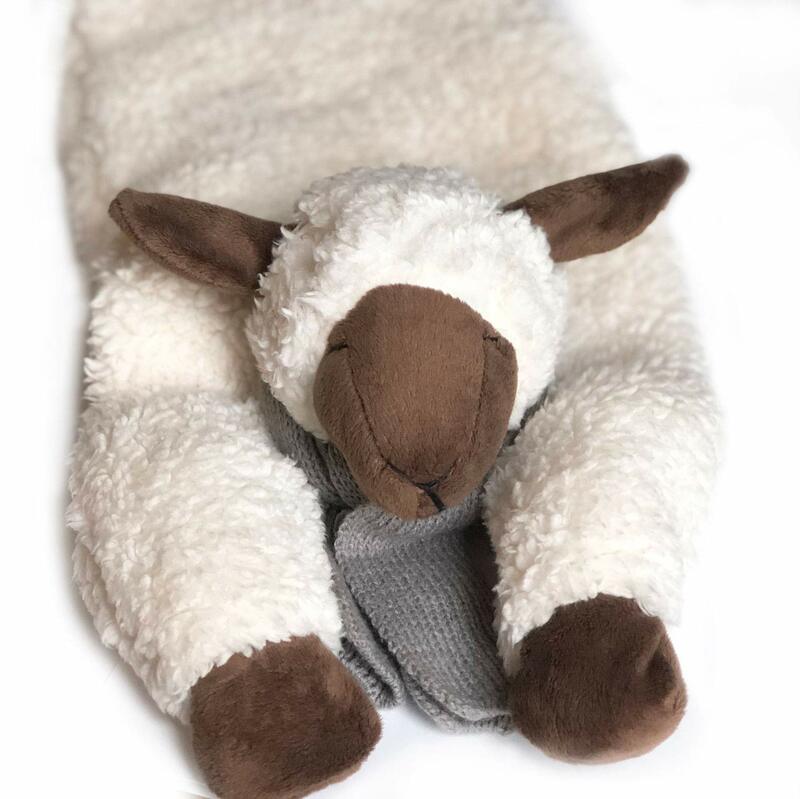 The Huggaroo sensory weighted weighted lap animal is available in 2 fun and cuddly options designed specifically with children in mind: a snuggly weighted lamb or a super cute furry puppy. It’s been tested by a U.S. Consumer Product Safety Commission approved lab and is an ideal weight for children to carry around the classroom (if permitted), home or during car trips. Weight And Size: 3.6 lbs, 29 x 8 inches. What’s The Lap Animal Made From? : The removable outer cover is made from super soft, plush and tactile Minky fabric (polyester), making it ideal as a soothing aid for sensory seeking kids. The weighted insert contains ‘hypoallergenic, food-grade polypropylene pellets’ which are well distributed among 5 ‘pockets’, or compartments, for even distribution. This prevents the pellets from all slipping to one end of the lap pad, which can both lead to uneven weight distribution and more annoyingly, cause the lap pad to slip off your child’s lap. Is The Lap Pad Animal Washable? Yes. Let’s face it, anything at the hands of young kids is likely to get grubby! So the good news is that Huggaroo weighted lap animals are 100% machine washable. The Huggaroo website recommends machine cold wash on a gentle setting. For best results, it’s also recommended you wash the removable lap pad cover and insert, separately. After washing, you can air dry or air fluff in a dryer (the setting that doesn’t use heat). Whilst there are no ‘official’ weighted lap animal guidelines, as the name might suggest, occupational therapists recommend laying the lap animal across your child’s lap, whilst in a seated position. Keep in mind, lap pads are not designed to be used all day long, but rather for short periods – for example, when a child is feeling anxious or is struggling to calm down or focus. Occupational therapists also don’t generally recommended weighted lap pads for children under the age of 3.
during activities that may cause a child anxiety, such as trips to the dentist or doctors. Of course, some children may not have a sensory processing or attention deficit disorder, as such, but may still experience feelings of stress or anxiety. This study (PDF), from 2015, found that the use of a weighted vest (which works in a similar way to a weighted lap pad) did in fact, decrease anxiety, in study participants. So the therapeutic deep touch pressure of a lap pad, vest or sensory weighted lap animal can also be an effective tool to help anxious children experience an increased sense of calm. Do Weighted Lap Animals Work For All Children? All children are unique individuals and unfortunately there’s no blanket rule for which type of child a weighted sensory aid will (or won’t) work for. However, as a very loose ‘guideline‘, sensory seeking children – i.e. those who actively seek out extra tactile stimulation – often benefit from the grounding proprioceptive input of a weighted lap animal or lap pad. 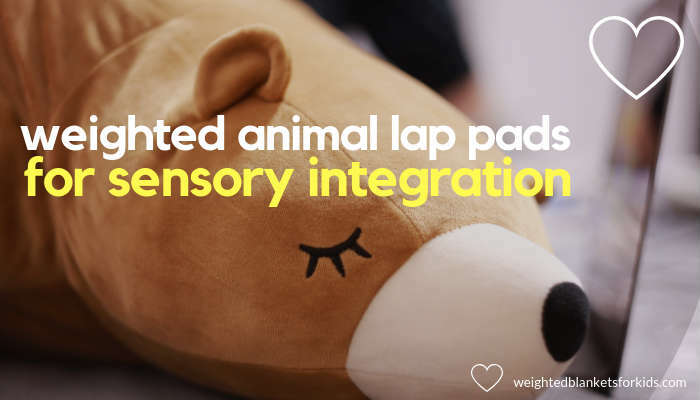 Children who are extremely sensitive to sensory stimuli, on the other hand, (for example, a child who avoids hugs or throws blankets off) may find the weight of a lap pad animal too intense. It’s always best to be guided by your child and if you’re unsure, seek advice from an occupational therapist or doctor. A child should also be able to move a weighted item off their own lap/body unaided, at all times. 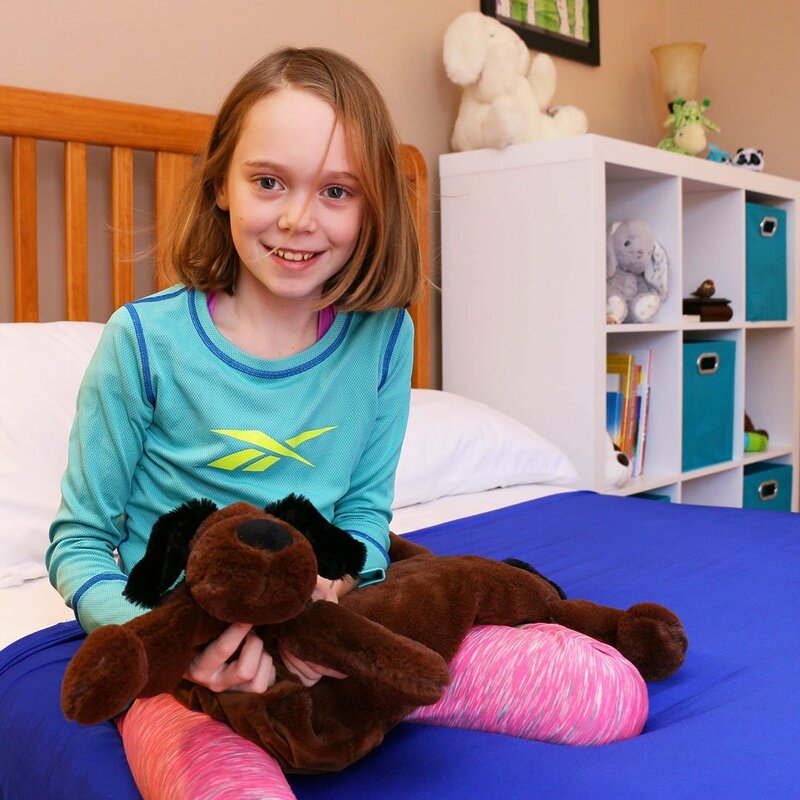 A weighted stuffed lap animal for sensory integration, is a practical and affordable way to help children with sensory processing and attention deficit disorders, calm down and better ground themselves. The Huggaroo weighted lap lamb or puppy is a popular option, rated by many parents, teachers and therapists. It’s easy to use, portable and easy to use at home, in the classroom or during trips out. Of course, a weighted lap pad doesn’t have to feature a stuffed animal or ‘buddy’ element. So if you’d like more options, including a wipe clean lap pad and a Minky Dot sensory lap pad, check out my 3 favourite weighted lap pads to help children calm down and focus.